Hop on and off a big pink double decker all day long. You’ll view Saint John’s top attractions at designated stops on the 90 minute tour route. The tour includes informative historical and culture commentary from local guides. Learn about the Great Fire, history of shipbuilding and the Bay of Fundy's high tides. See the Saint John City Market, Uptown Saint John, Jewish Historical Museum, Reversing Falls Rapids and New Brunswick Museum at your leisure. • Saint John: Look for history and adventure along the Bay of Fundy, from city attractions to intriguing reversing rapids. 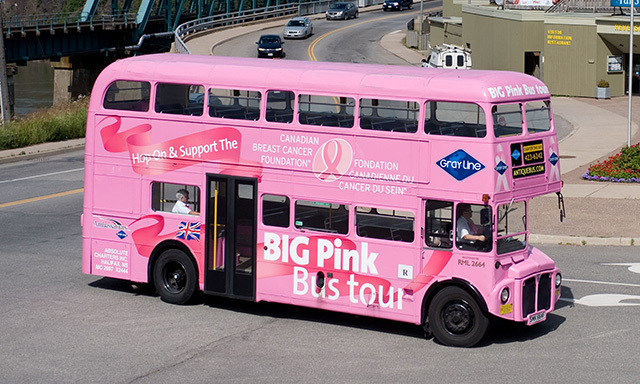 • Big Pink Double Decker: Buses stop at sights every 15 to 30 minutes — hop on and off all day long. • All Day Pass: Explore city museums, uptown shopping, City Market and Reversing Falls Rapids at your own pace. • Big Pink "accordion" motor coaches may also be used. • Admission to local attractions not included in price of tour. • Adapt vehicles not available for this tour. • Collapsible wheelchairs can be stored, but only one per double decker due to safety requirements. • Double Deckers depart pier and all stops approximately every 15 - 30 minutes all day.